By olduvai in Economics on January 20, 2019 . My girlfriend brought up a point about your work during coffee this morning. Basically, she’s confused about the two dates you often mention, 2020 and 2032. She wants to know which date (2020, 2032) you expect the markets move into crises mode due to the lack of confidence in government. I tried to explain but my insight wasn’t good enough. Could you explain in a future blog the difference between these dates and what you (Socrates) expect to happen during these points in time? ANSWER: The 2032 date is the conclusion of this Private Wave. That is when the power of the West will begin to shift to China for the next cycle that begins thereafter. 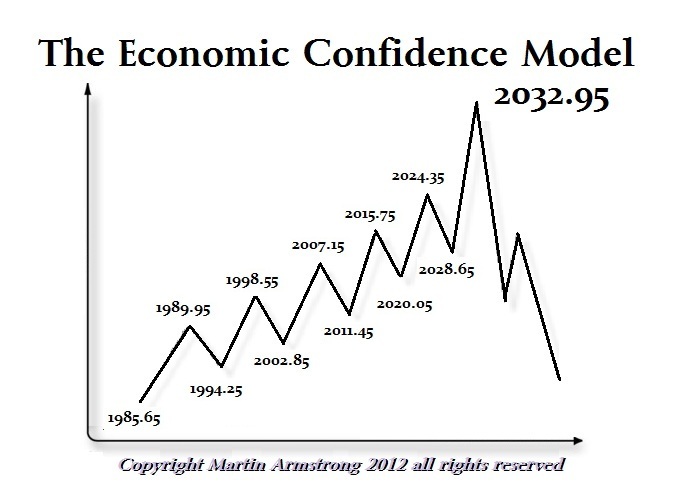 The 2020 date is when the confidence begins to noticeably begin to turn down for the AVERAGE person. You can “feel” it in the air already. What the Democrats have done is simply unbelievable. Sure the people who hate Trump cheer. But they fail to understand the system. Whatever they do to the Republicans sets the stage for what will be considered “normal” for the Republicans to do to the Democrats if power shifts. I have explained that the Democratic victory in the House was really a disaster for this has allowed nothing but the next two years to be confrontation as we are witnessing on the funding of the wall which is only $5.7 billion. In Fiscal Year 2019, the federal budget will be $4.407 trillion. The U.S. government estimates it will receive $3.422 trillion in revenue. That creates a $985 billion deficit for October 1st, 2018 through September 30, 2019. Not only is this less than a single week’s interest payment of $6.7 billion, it is .001% of the annual budget. It is so meaningless it illustrates my point. The Democrats think all they have to do is demonize Trump and OPPOSE absolutely everything he proposes to win the White House in 2020.